The government said some fees would be considered mandatory, such as campus athletic facilities and those related to student health and safety, such as campus safe-walk programs. Ontario Premier Doug Ford defended his decision to allow students to opt out of some additional fees by accusing student unions of getting up to “crazy Marxist nonsense” in a fundraising letter to party supporters. Mr. Ford’s government last month announced a number of changes to the financing of the postsecondary education system, including a plan to make many student fees optional. Student groups have protested the proposed changes, saying they would dramatically alter life on campus. Most believe that giving students the right to opt out of fees could hobble student unions, which fund a range of services from newspapers to food banks and minority student groups. Student unions have emerged as one of the loudest voices of opposition to Mr. Ford’s proposed changes to higher education. Groups have rallied outside Queen’s Park several times since the government announced its intention to make significant changes to the way postsecondary education is funded. 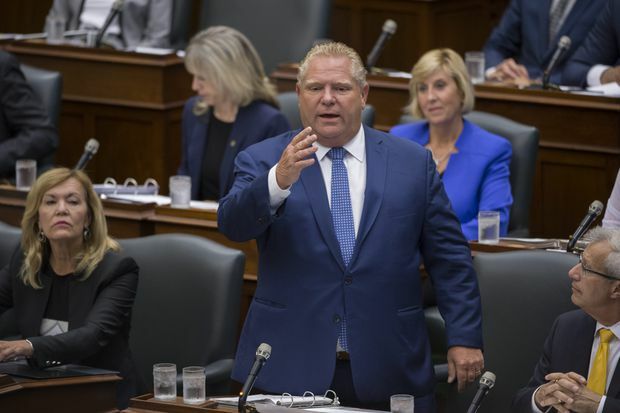 Nour Alideeb, Ontario chair of the Canadian Federation of Students, said Mr. Ford’s attack confirms the fear that the Student Choice Initiative is aimed at hurting political opponents, not reducing the cost of higher education, she said. “The Student Choice Initiative isn’t about saving students money. It’s about breaking down the organizations that advocate for students’ interests,” Ms. Alideeb said. Danny Chang, president of the Ontario Undergraduate Student Alliance, said student governments are ideologically diverse and democratically elected. The services they provide are in many ways essential to the campus experience students have come to value. “It’s concerning. We were told the impetus for the Student Choice Initiative was to give students more choice. I think this e-mail points in a different direction than we thought,” Mr. Chang said. Student leaders sent a letter to Queen’s Park at the end of January – signed by more than 75 student organizations that represent more than a million students – in which they made clear their opposition to allowing members to opt out of fees. “Without stable, predictable funding, student unions will be forced to end a wide variety of programs and services – everything from mental health to sexual assault supports, and laying off thousands of students that work at on-campus businesses, undermining the protection and creation of jobs on campus,” the student letter said. The government said some fees would be considered mandatory, such as campus athletic facilities and those related to student health and safety, such as campus safe-walk programs. A full accounting of what will be considered optional has not yet been made public by the provincial government. The letter from Mr. Ford also touted his government’s decision to reduce tuition fees for domestic students at Ontario colleges and universities. The loss of tuition revenue for the schools will not be covered by the government. Universities and colleges will need to adjust their budgets, likely either by increasing revenue from international students or finding ways to reduce costs. The government also said the grants promoted in 2016 by the former Liberal government as “free tuition” for low-income students would now be a mix of grants and repayable loans. “A family bringing in $170,000 a year was still getting $2,000 in grants. Sorry folks, but government grants should be for people who need it most,” Mr. Ford wrote.